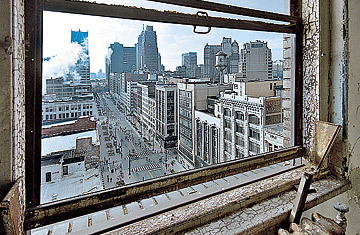 View of downtown Detroit through a window of the Broderick Tower on Woodward Avenue, 2005. If Detroit had been savaged by a hurricane and submerged by a ravenous flood, we'd know a lot more about it. If drought and carelessness had spread brush fires across the city, we'd see it on the evening news every night. Earthquake, tornadoes, you name it  if natural disaster had devastated the city that was once the living proof of American prosperity, the rest of the country might take notice.